noiseLAB Wind provides a number of open data interfaces that gives greater flexibility and interoperability with third party tools. The above diagram shows the major data flow paths in the system, and some of the major data formats used. In the following these will be described in detail. IEPE powering is provided by National Instruments NI USB 9234 and other NI DSA compatible modules. The USB 9234 can be powered from the USB port of a laptop computer with only a minor decrease of battery life. The USB 9234 can provide power for up to four microphones. However, microphone preamps with built-in gain, such as the GRAS 26CF require more power, and hence only two of these can be connected to each USB 9234. Analog cable lengths of up to 200 m from microphone pre-amp to the USB 9234 are possible without signal degradation due to cable length. Data from Met masts can include wind speed, direction, temperature, pressure and humidity. noiseLAB Wind can handle all of these in analog form with AC or DC voltages from 0 to +-10 V using the NI USB 9215A. The 9215A is powered from a USB port of a computer. The 9215A samples up to 100 kS/s per channel, and the noiseLAB Wind Software provides user settable gain and offset on a per-channel basis. In addition, for frequency proportional outputs (typically seen from anemometers), software in noiseLAB Wind converts this to wind speed units. Selected meteorology masts with RS-232 outputs are also supported. Contact DELTA for more details. The Wind turbine power curve and wind shield correction curves as entered into the system from well-defined delimited text files. Wind turbines can output a number of parameters, either by analog or digital interface. These parameters can include power output, RPM, Pitch, Yaw, Nacelle Wind Speed, etc. When these are available in analog form, up to four of these can be digitized by each NI USB9215A. Each channel provides user settable gain and offset. For digital outputs, DELTA provides standard RS-232 drivers for a range of Vestas and Siemens Turbines. The turbine parameters are typically sampled at 10 samples per second, and averaged in software to give one second averages. This software runs on the data acquisition computer which receives data from the above mentioned devices via USB or RS-232 ports. Wi-fi or cabled Ethernet can also be used to connect to the USB devices, which are placed in an Ethernet Adapter cradle to enable networking these. To give more robust operation, each device is assigned a fixed IP address. Cabled Ethernet is recommended in uncontrolled environments such as residential areas where risk of mechanical or electrical interference are higher. The digitized microphone signals (24 bits resolution) are converted to 32 bit single precision floating point for internal storage. For each microphone channel the following is computed and stored to disk in user selectable time slices (typically 10 s or 60 s): LAeq, ⅓ octave Sound Level, A-weighted ⅓ octave sound level, and FFT spectra. All of the above are averaged using linear RMS integration. The incoming signals are sampled at 10 S/s, and averaged to 1 second values, which are recorded on disk as time domain waveforms. In addition, these are processed into time slices, typically 10 or 60 seconds. The raw time domain waveforms are stored in the National Instruments TDMS format. This format lets your PC serve as a multi-channel “tape recorder” where high numbers of channels can be stored with individual sampling frequencies per channel. Data is time stamped with a 128-bit time stamp. In addition, meta data related to the measurement is also stored in the recording. Recording duration is limited only by disk size, since the sample counter in TDMS is a 64 bit integer. The TDMS format is open, and data can be read from a broad range of software including LabVIEW, C, .net languages, MatLab, Excel, Open Office, and Diadem, a powerful data explorer package. All data is written to disk in as simple as possible a file format which only appends to disk files, thus making files more robust in terms of recovery from crashes. Time domain data is written in the TDMS format as described above. Acoustic results(except FTT), Met and Turbine data are written to a delimited text file in the user-selectable time slices (typically 10 or 60 s). This is a temporary file which is converted to Excel at the end of the measurement. FFT time sliced spectra are stored in a separate delimited text file. The text delimited files are self-documenting with clear labels and axes. noiseLAB Wind provides a time coherent data collection system. However, for some applications, it may be desired to input parameters from different devices, such as autonomous data loggers. This can be done after the measurements are complete, by taking the external data, ensuring that it is time-aligned with the data in the above spreadsheets, and copying it into the spreadsheet. Likewise, FFT spectra can be copied into the FFT spectrum file. In these cases, the user is responsible for time alignment and calibration integrity of these data. For round robin testing and other applications, it may be useful to input .wav files into the system. This is done by importing the .wav files into noiseLAB Pro, and performing time slice analysis of FFT, LAeq, and ⅓ octave spectra using it, and exporting these to the appropriate files as described above. Again, time alignment and calibrated must be managed by the user. Based on the Acoustic, met, and turbine data, the sound level and sound power is calculated by the noiseLAB Wind Sound Level/Sound Power Module according to IEC 61400-11. This module also provides validation of data by auditing potential outliers by viewing their spectra. Audio files may also be monitored in an audio monitoring utility included with the system. noiseLAB Wind provides the Tone Analysis Module which performs the tone analysis specified by IEC 61400-11. This is based on the FFT spectra generated by the data acquisition software as well as the met parameters. The software module calculates this for all required parameters as specified by IEC 61400-11. All of the above modules output their results in tabular and graphic form in Excel. From here, the plots and tables can be copied and pasted into your final report. This gives high flexibility in creating reports suited for your organization, including choice of language, layout, logos, etc. while easily importing the final results in a Word compatible format. In the following presentation you get a good overview of the noiseLAB family, including lots of screen shots and pictures from the field of the system in action. And stay tuned for the official release of the next generation noiseLAB coming soon. noiseLAB Wind now provides Wi-Fi capability of up to 1000 meters line of sight. But at this distance, unplanned events can occur. The meteorology mast and wi-fi antenna was surrounded by an electric fence, which unfortunately, the farmer did not provide powering for. 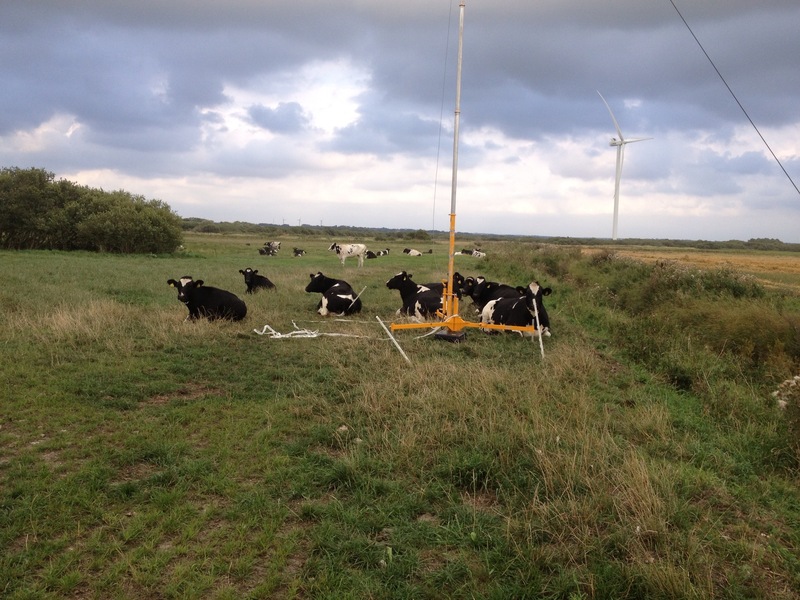 The cows toppled the fence and the antenna, thus interrupting the measurement. Satisfied with their achievement, the contented cows are seen relaxing next to the “crime scene” and chewing their cud. Fortunately, we can access the main data collection PC remotely by an iPad, thus making it possible to tune the antenna angle for optimum transmission back to the PC. On the web page linked to above, enter 100 (this is the company number for DELTA) in the search field for “Registrationnumber”. Under this standard, DELTA is specifically certified with respect to Wind Turbine Measurements and many other methods in this list of methods. A search for 61400 on this list of methods will show the DELTA’s accreditations for wind turbine noise. In addition, conformance to relevant acoustic Type 1 standards for noiseLAB and noiseLAB Wind are tested by an external indepedent laboratory. DELTA today announced the release of noiseLAB Wind at the Wind Turbine Conference in Denver. 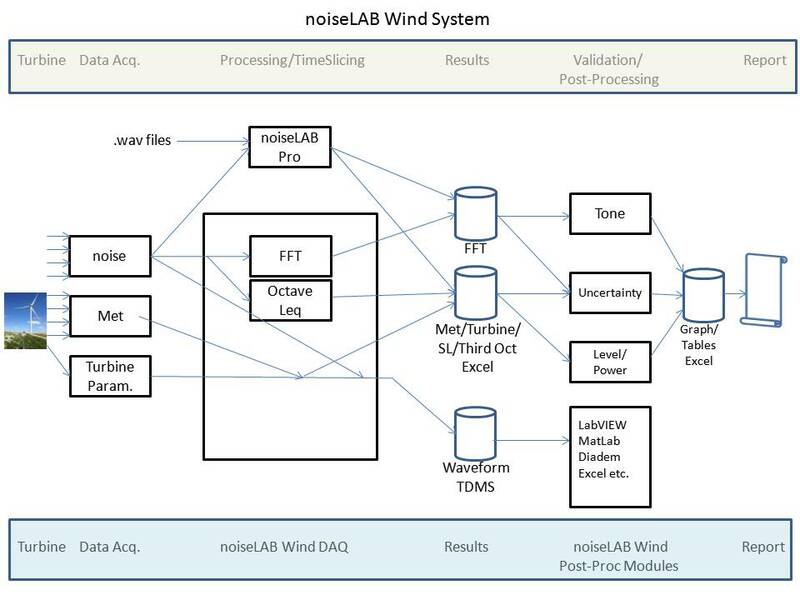 noiseLAB wind provides wind turbine noise certification to IEC 61400-11 Edition 2 and 3 in a customized system with real-time wireless streaming of microphone, metrology and turbine process parameters up to a distance 1000 meters (line of sight). All signal processing, including 1/3 octave and FFT analysis, wind binning, third octave sound level and sound power computation, tone analysis, and measurement uncertainty calculations are part of the system. Measured and derived parameters are processed and stored real time to disk during the measurement, including all time domain waveforms. The highly interactive user-interface permits monitoring of measurement progress, including real time update of wind-binning progress, curve fitting, and scatter plots. Ad hoc signal analysis can be performed on the running system, independent of the analysis functions being stored to disk. Audio monitoring of any acoustic channel is also included. noiseLAB Pro: Multi-channel recording, editing, and analysis of noise and vibration signals, including sound quality, tone and impulse metrics. A new version of noise of noiseLAB Batch Processor is now available with updates to the tone analysis methods as described in this read me file. The new version (3.1.1.4) may be downloaded here. If you are running under Windows 7, remember to install and run the program as systems administrator. Your existing license keys also apply to the new version. BETA01 has multiple new functions, including Sound Quality, Vibration, and Impulse Annoyance (Nordic Method). The beta will expired on October 31, 2013. Both are based on formal listening panel tests by DELTA’s SenseLAB. Beta 2 will be available Early November 2013. The Beta is compatible with existing noiseLAB Project files (.nlp extension) and requires that you have created these files with noiseLAB 3.0.17. Unzip the file, and navigate to the .nlp file from the noiseLAB Batch Processor BETA. The next BETA(02) will include a new Recording and Editing front end based on the use-of-ease in noiseLAB Express. DELTA will present four noise related papers at the Danish Wind Power Research Conference 2013 on May 27 and May 28, 2013. The link to the conference is here and the link to the program is here. Impact of noise from Wind Turbines, Torben Holm Pedersen, Senior Technology Specialist DELTA. (May 27 morning). This paper will also include an overview of current state of the art in low frequency measurement and annoyance evaluation. An additional paper from DELTA: “The Wind Farm as a System”, Total system analysis and modelling using synchronized sensors. Carsten Thomsen, DELTA, will explore how synchronized sensors create new opportunities for wind turbine measurements and modeling, including noise propagation. The Tone Analysis algorithms in the noiseLAB Batch Processor have now been updated and a beta version of the updated algorithms is now available. Read more here.